Today I am going to talk about the OSPF, OSPF is one of the most important and widely used routing protocol by enterprises. OSPF is easy to configure and very easy to understand. Today I am going to talk about some of the important facts of OSPF which will help any Network engineer to understand the OSPF easily. In a category of Dynamic routing protocols, OSPF is Link State dynamic routing protocol. The IP header of an OSPF packet specifies protocol number 89. OSPF has a concept of Area's to administrate the network properly. To establish OSPF neighbor adjacency, hello/dead timers, MTU (otherwise have to use ip ospf mtu-ignore) must match. Unique router-id is also required. OSPF cost can be modified using interface bandwidth command, interface ip ospf cost command, process auto-cost reference-bandwidth command, or neighbor cost command on point-to-multipoint non-broadcast network. OSPF sees secondary networks as stub networks and cannot make adjacencies over secondary addresses. OSPF will advertise a secondary network or subnet only if it is also running on the primary network or subnet and OSPF routes of secondary addresses must be in same area as the primary address to be advertised. To learn routes from a neighbor connected to the secondary network, another routing protocol such as RIP should be running and redistributed into OSPF. Another solution to this kind of problem is to create dot1q sub interfaces. The primary interface and IP unnumbered interface will have OSPF enabled if a network statement matches the IP address of the primary interface. An OSPF external route cannot use another OSPF external route as its next hop. Virtual links are not allowed in the stubby area or NSSA. In this case OSPF can be tunnelled over a stub area using GRE tunnel (tunnel must be connected to area 0). Inside an area, OSPF uses Link State logic, but between areas OSPF acts much like a Distance Vector (DV) protocol in some regard. For example, the advertisement of a Type 3 LSA from one area to another hides the topology in the original area from the second area, just listing a destination subnet, metric (cost), and the ABR through which the subnet can be reached at all DV concepts. Only broadcast and non-broadcast network elect DR/BDR based on priority or router-id (in case of a tie in the priority). 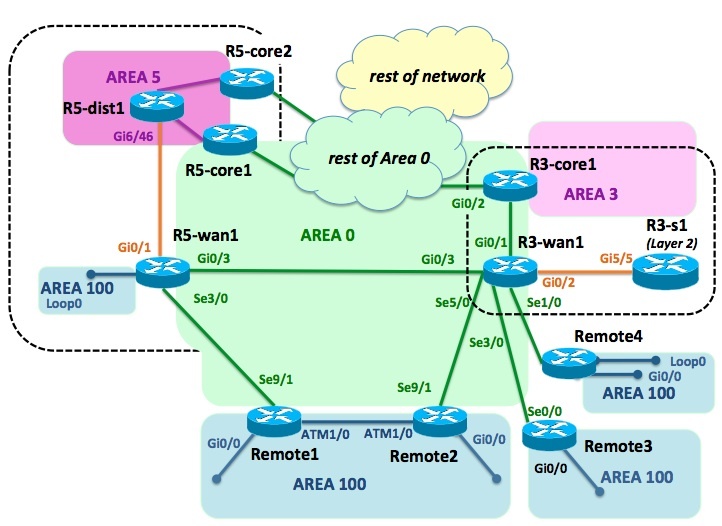 The only time that OSPF will form adjacencies between neighbors that are not on the same subnet is when the neighbors are connected through point-to-point links using ip unnumbered. In non-broadcast network, DR/BDR must have layer 2 connectivity to all other routers in the same area. With OSPF network types broadcast and non-broadcast, next hop values are not modified when updates are transmitted across an NBMA media. Both point-to-multipoint and point-to-multipoint non-broadcast network type update the next-hop value of routes learned on partially meshed networks to the directly connected neighbor, and advertise the network as a set of endpoints instead of a transit network. OSPF network point-to-point is the default option for point-to-point interfaces such as HDLC, PPP, or point-to-point NBMA sub-interfaces. As only broadcast and non-broadcast network type elects DR/BDR, they are compatible with each other, but they are not compatible with any other network types. Only OSPF point-to-multipoint and point-to-multipoint non-broadcast network types support OSPF cost value on a per neighbor basis. On point-to-multipoint broadcast networks, if the neighbor command is used, a cost to that neighbor must be specified. But on point-to-multipoint non-broadcast networks, the neighbor command must be used to identify neighbors, assigning a cost to a neighbor is optional. The internal OSPF routes can only be summarised on ABRs whereas the external (redistributed) routes can only be summarised on ASBRs. The Command area default-cost is used to specify a cost for the default summary route (default cost 1) that is sent into a stub area or NSSA. In NSSA, ABR with the highest router-id does the LSA 7 to 5 conversion. In NSSA, default-information originate command cannot be used, since it generates Type-5 LSA, which is prohibited in NSSA area. NSSA ASBR can generate a default only when it has a default route in its routing table whereas NSSA ABR can generate a default route with or without a default route in its own routing table. If the authentication is wrong on the virtual-link, the virtual-link interface will not go down immediately. As the virtual-link does not support periodic hellos, clear ip ospf process command should be issued if the authentication is enabled on the virtual link. The virtual link will not come up if the only interface to reach the other end of the virtual link has a cost that is maximised (65535). For BGP to redistribute routes into OSPF, the router-id must be identical, in OSPF and in BGP. OSPF filtering using distribute-list , route-map (match route-type, match ip route-source, match ip next-hop), and distance commands can only block route from entering into local RIB, but cannot stop LSAs propagation into the OSPF database. OSPF defaults to cost 20 when redistributing from an IGP, and 1 when redistributing from BGP. neighbor database-filter all out only works on point-to-multipoint network types. If distribute-list out command is configured on an ASBR, then the ASBR generates Type 5 external LSAs only for those networks that are explicitly permitted in the distribute list. OSPF demand circuit sets do not age flag on all LSAs learned and will only send updates when there is a change in the OSPF topology. The command must be configured in a point-to-point link and is needed only on one side. If the router is part of a point-to-multipoint topology, only the multipoint end must be configured with this command. The main difference between flooding reduction ip ospf flood-reduction and demand circuits ip ospf demand-circuit is that former suppresses only periodic LSA refreshes; it does not suppress periodic hello packets. Thus, the flooding reduction feature does not impair the detection of a neighbor router going down. OSPF stub router max-metric router-LSA advertises all non self-originated routes/LSAs with maximum metric. When redistribute maximum-prefix command is configured, the redistribution limit does not apply to default routes or prefixes that are generated as a result of Type-7 to Type-5 translation.